These cavalry have taken a bit longer to finish than I thought they would, mainly from my stupid sequencing of steps which meant I had to go back over things and touch them up. I've learnt my lessons for the next batch. 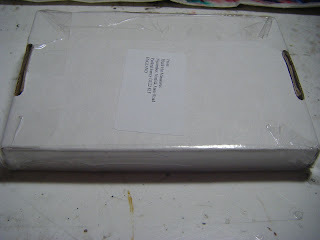 I also had another package delivered this morning. 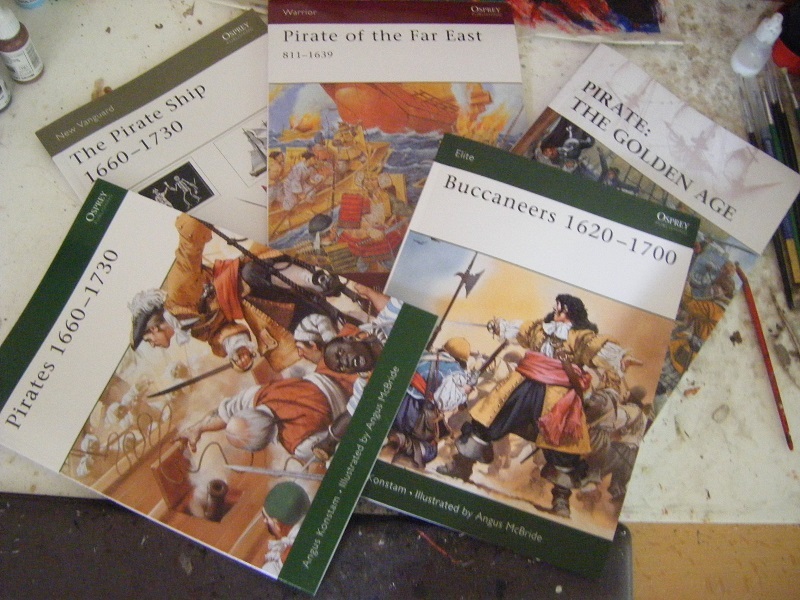 Not more piratical plunder though. This was a set of resin buildings from Kerr & King - an Oriental gatehouse and an Oriental "city" set (5 buildings does not a city make!). The buildings look great with removable roofs and interior detailing. Arrrrrr! 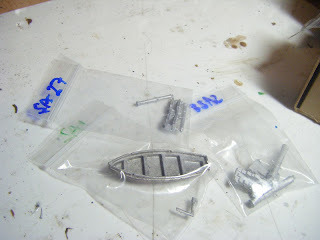 More plunder has come in to my pirate port. Yes, that is an Arab-style tent. I figures that any pirate captain able to assemble such a large force would want something a bit flamboyant as their command post when on land. However, this one is rather small, so I may need to order the larger one. 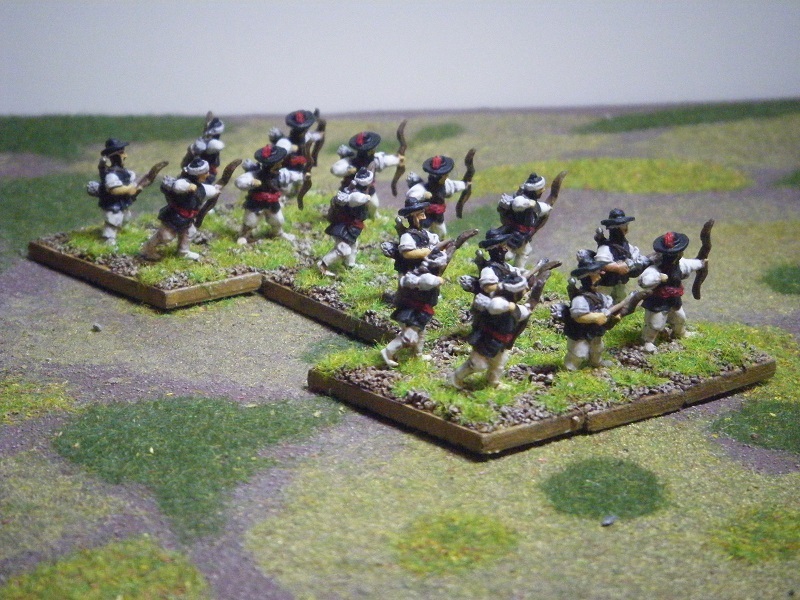 As for the Marlburian era troops, I got them to see whether they'd be suitable for inclusion in my pirate army. 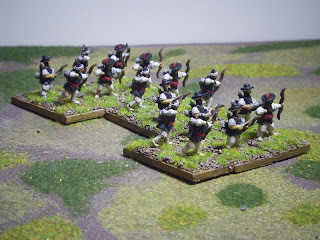 A few of them are, the rest I can use for colonial troops if I find a suitable set of pirate skirmish rules alongside any pirates that I have left over from doing my FoG:R army. 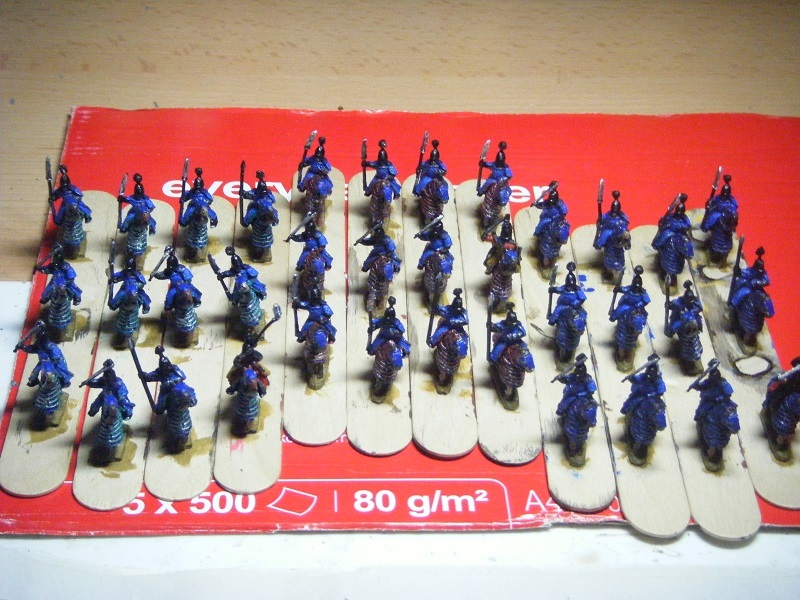 I've made some good progress on the first batch of cavalry. 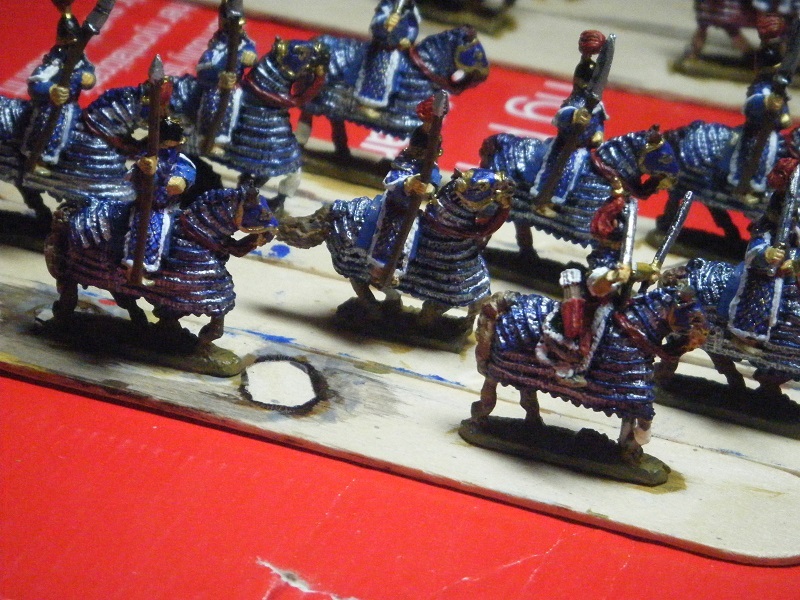 These will be Kwang Gun or Singi Gun cavalry - probably the latter as that upgrades them from Average to Superior. Having done a bit more research into their armour I found I'd made a boo-boo when I started them a couple of weeks ago. I'd dry-brushed their coats with Oily Steel, however their armour actually consisted of metal or leather plates/scales inside a coat with rivets showing through on the outside. 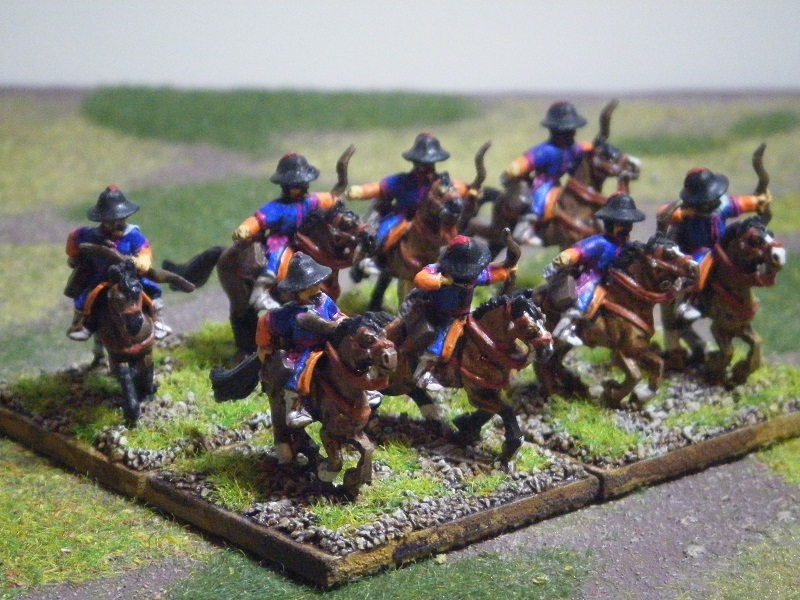 From what I've been able to gather the guard cavalry would have had red coats, other cavalry blue. 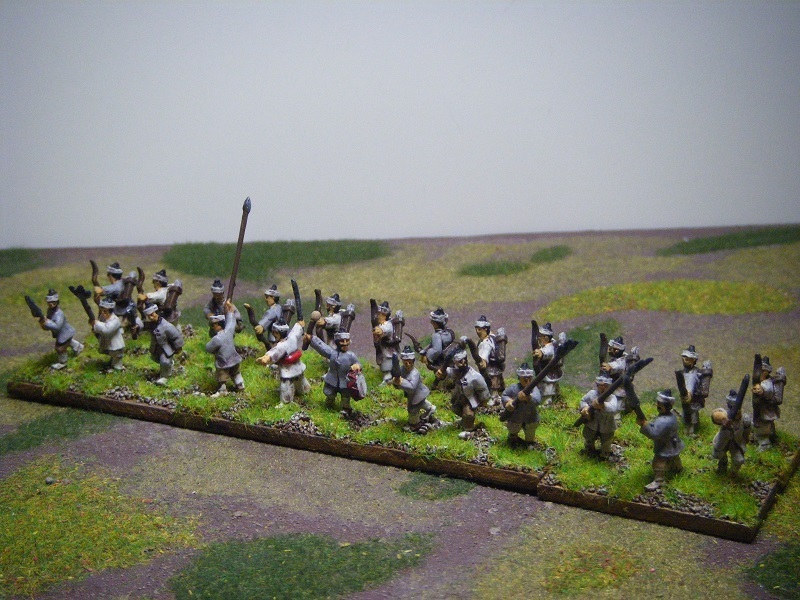 I've done the officers with different colours to mark them out. 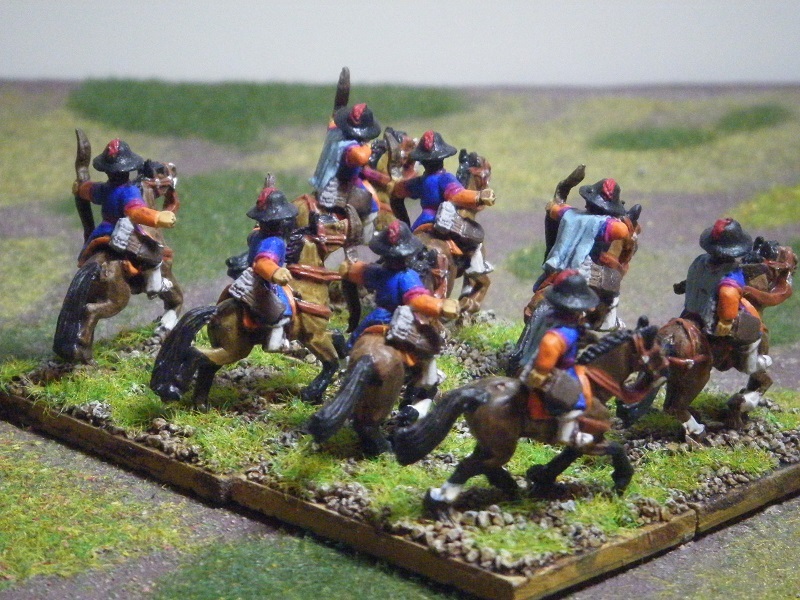 The horses still need a bit of work - I need to do some as bays, lighten the tails of a couple of the chestnuts and do leg markings. 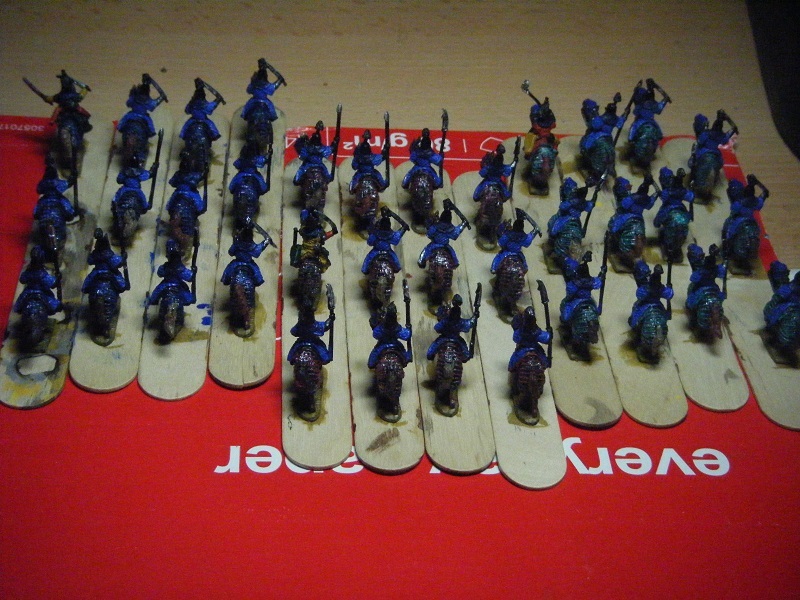 The riders have a few more steps to do to finish them, but I should be able to complete them tomorrow. Aaarrrhhh, me hearties. You will remember that my good (well, as good as any of us piratical types can be) accomplices of the freebooter Royal Mail did try to bring me a package from ole Captain Grumpy yesterday, but I did be aways from me port so they missed me. Wells, they dids think it unsafe (and rightly so) to leaves me package there where scurvy dogs coulds ave aways with it in mes absence. OK, that's enough silly piratical mangling of the English language for one post. 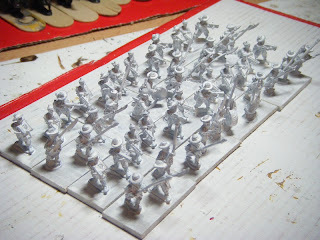 Last night I prepped the figures for my regular ("Kwang Gun") foot units and left them soaking in soapy water overnight. This morning I rinsed them and left them out to dry while I was at work. This evening I have glued them onto their bases and primed them. 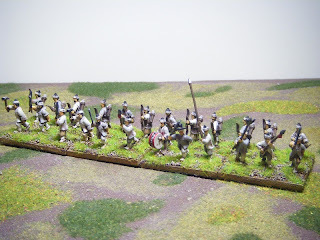 I have learnt one lesson from doing the levy troops on their bases - don't add the gravel yet! 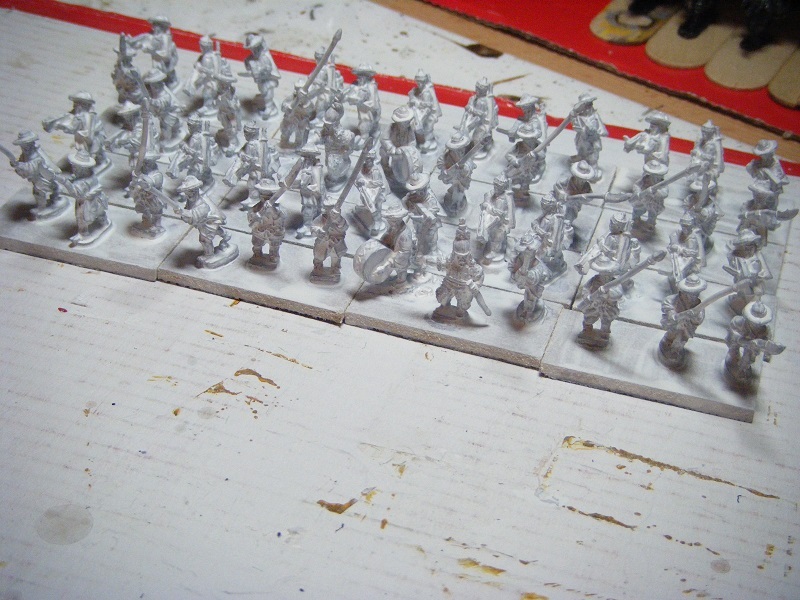 I'll make a start on the cavalry tomorrow night. I'll be splitting them into two groups of 36 - guard and non-guard cavalry. 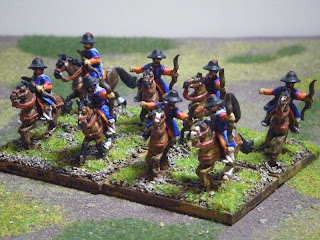 After the weekend's flurry of posts I thought I'd have a break from blogging last night. 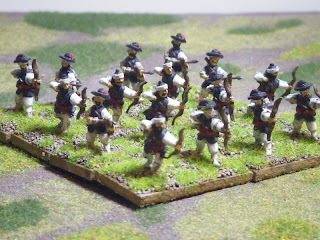 Over the last 2 nights I finished painting the levy troops for my Korean army. Splitting them into 2 batches certainly helped. 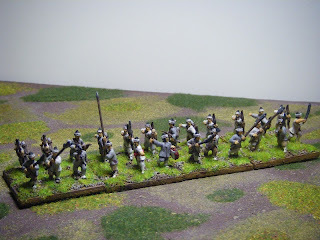 This evening I've sprayed them with matt varnish and flocked them. Here are the pics. In FoG these will be Poor medium foot (have to re-roll 6s; vulnerable to cavalry in the open) with a heavy weapon front rank and bow armed rear rank. It is compulsory to take at least 10 bases of them and they have to be fielded as 8s or 10s. 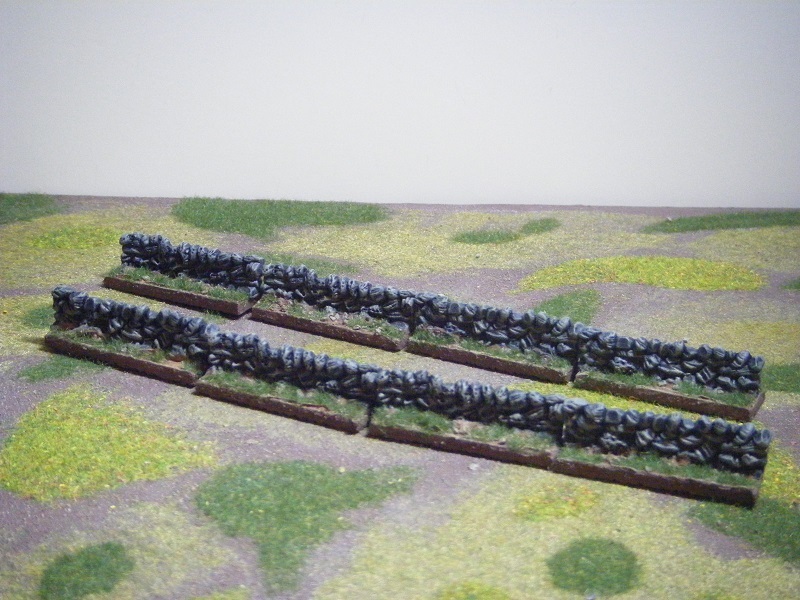 They'll be kept in the rear to defend against flank marches and any breakthroughs by enemy light horse or cavalry. My plan to do the prep for the regular foot and command stands during my lunch breaks at work has hit a minor hurdle. At the moment I'm lucky to get 30 minutes to buy something to eat, get back to my office and eat it. 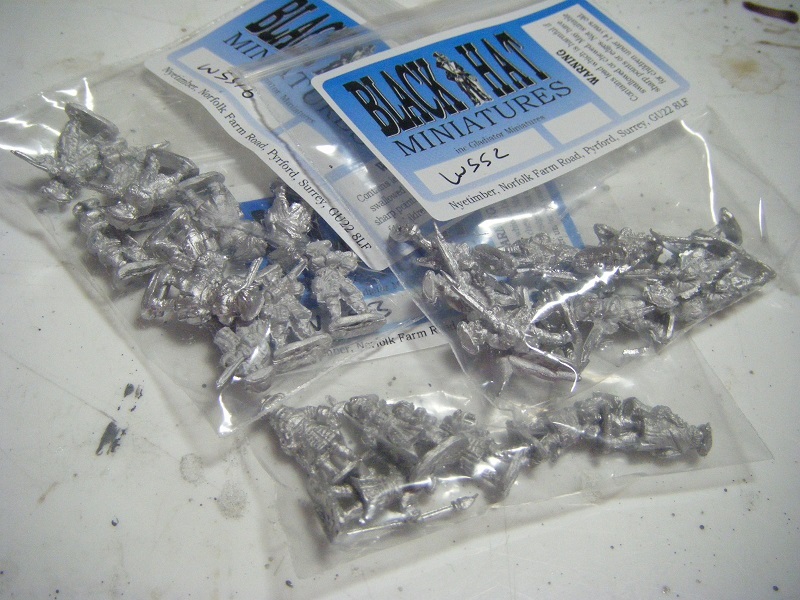 So, I've brought the figures home and I'm going to start prepping them while painting the cavalry. 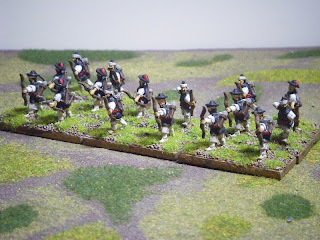 It's going to be tight getting these finished - I've got just over 2 weeks to paint 72 cavalry (already started, so might not be too bad), 48 infantry and about 20 foot and mounted figures for the command stands so that the army is ready for Campaign. "Splice the Cabin Boy and Roger the Mainbrace! *hic*"
Project Pirate Pandemonium continues apace. Royal Mail tried to deliver my first package ("Grumpys" from East Riding Miniatures) today, but it was too big to go through the letterbox so I'll have to collect them from the local office. I'll probably do that on Saturday morning. 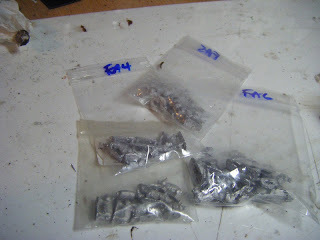 I've also got a small order from Essex which has been sent. 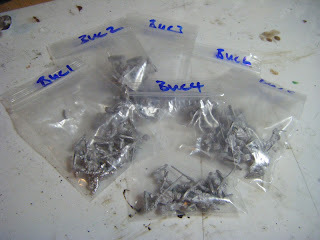 To get me in the mood and for some painting inspiration I've ordered a couple of Ospreys off Amazon. Obviously not mine. My behind is very trim and athletic*. 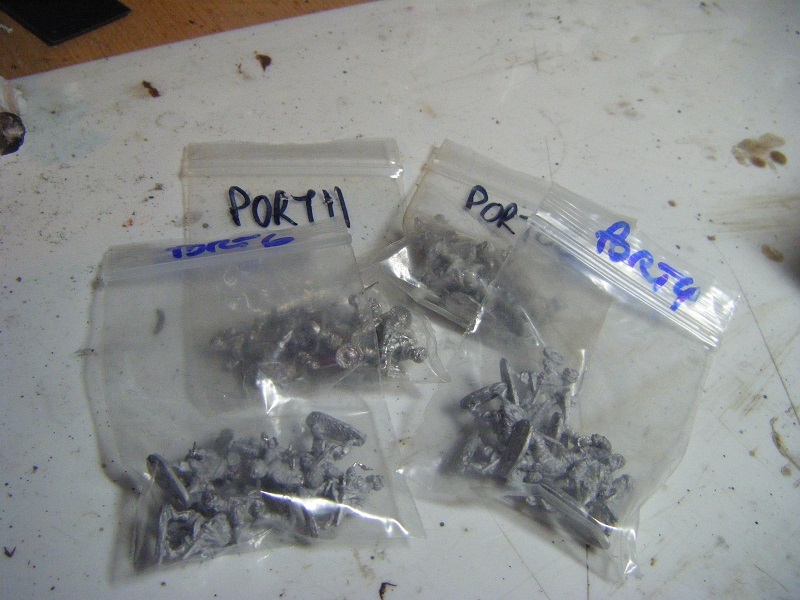 No, this is to let you know that my impulses took control and acted on my thoughts of doing a pirate army. I've placed a bunch of small orders with Rebel Minis, Old Glory UK, Essex, Black Hat and East Riding Miniatures. 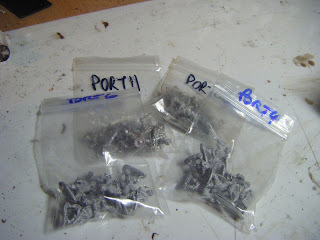 I'll also be placing some orders with Peter Pig, Museum, Minifigs and Donnington. My plan is to get as much variety of pose and dress as possible in the army. 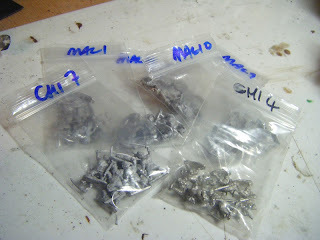 In my Rebel Minis order there were a few packs of sci-fi and pulp stuff as well - I was over the VAT-free limit, so thought I might as well make it worthwhile paying the £8 admin fee that Royal Mail will hit me for. I've been making a little bit of progress on my Koreans. 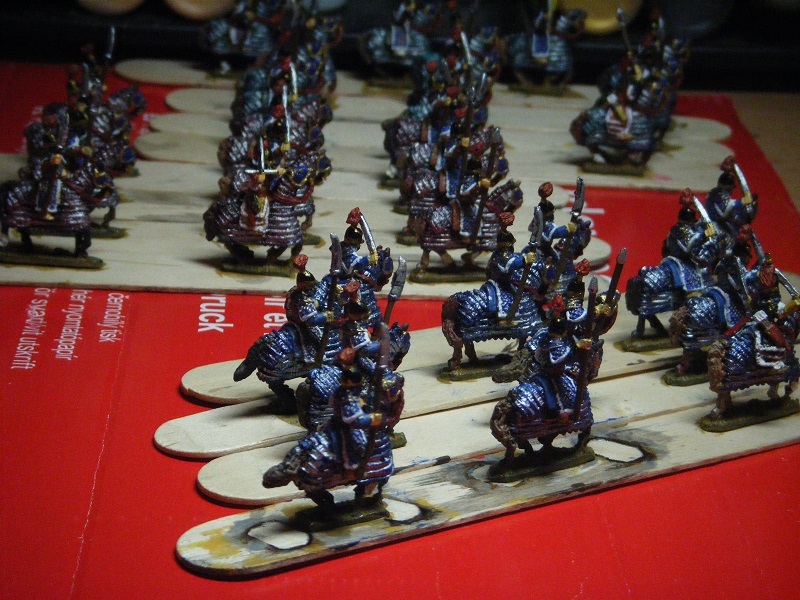 Last night I switched the cavalry to wider painting sticks to give a bit more stability (they kept toppling over on the thinner sticks). I also did the base colour on the bases of the levy troops. 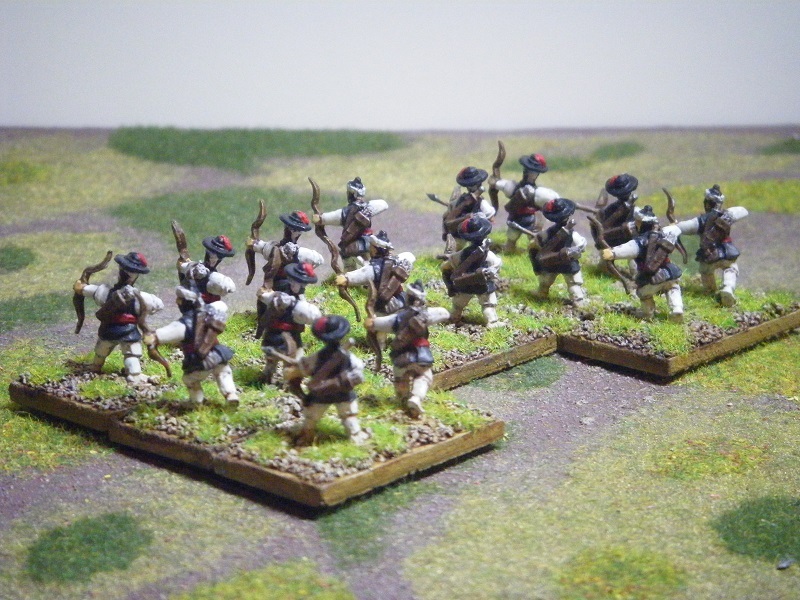 This evening I've been working on the levy archers. 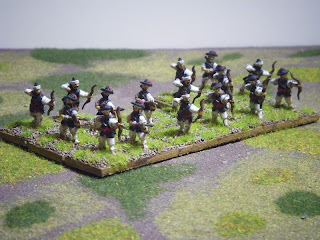 I decided to split the batch in two - archers and heavy weapons - for the rest of the painting, simply because it's easier to motivate myself to work on 24 figures than 48. 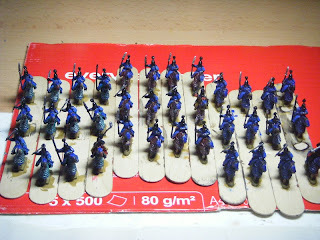 I should manage to get them very near to completion tonight. Then tomorrow I should be able to do the same with the 24 heavy weapons guys. After that it will be onto the cavalry. 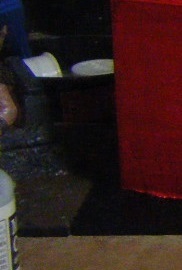 I think I'll need to take the command stand and regular foot figures into work with me to prep during my lunch breaks. At leas that will help make sure I have a chance of finishing them all in time! I took 191 pics of the games, which is clearly too much to load as individual pics in a single post. Instead I've included them as a slideshow (I hope it works!). I will put up one individual pic - of me with Henry Hyde, editor of Miniature Wargames with Battlegames. Hmmm, that is an absolutely awful pic of me - not a bad one of Henry though! Following last year's success, Ray and Fran organised another meetup of bloggers this year. By organised, I mean that Ray posted the invite to meet up on his blog. 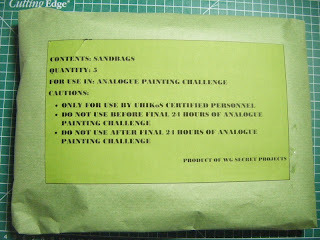 Post 2 of 4 about Salute. And this is the one with my swag. I did go along with a shopping list and was able to get evewrything apart from some Oriental scenery from Kerr & King. When prepping for the show, they cast up what they thought people were likely to be after and the Oriental buildings and fortifications weren't on that list. However, I was the 5th or 6th customer asking for them. They did have display pieces for the fortifications which looked pretty damned good, so I will be placing an order over the interweb. 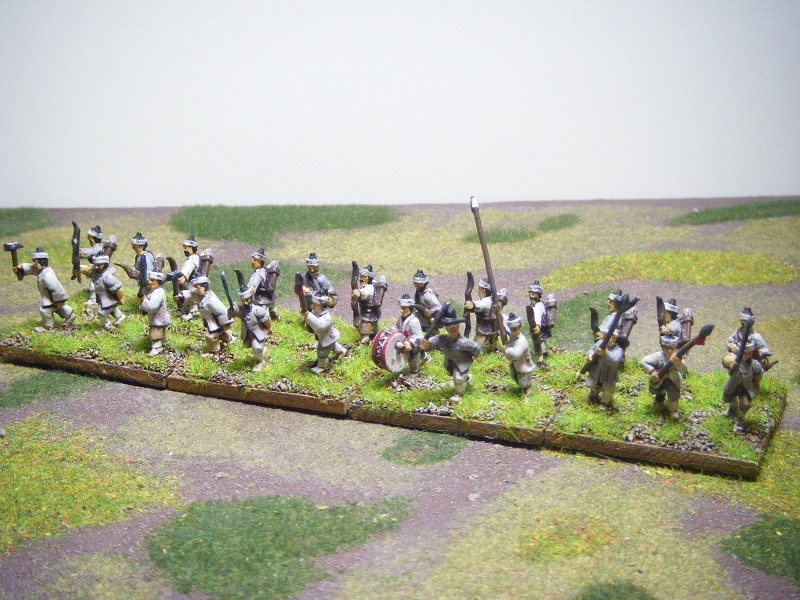 Some Renedra plastics - wattle fencing and Saxon tents; some stuff from 4Ground - an Anglo-Danish hovel and 3 peasant ox carts; some resin wagon loads; and It's That Man Again - the Dux has snuch into this photo as well! That evil man John "Mr GZG" Tuffley parted me from my cash again! This bunch is the Crusties start pack plus a pack of Crusties civilians. 6mm ACW from Baccus - 2 Union infantry booster packs; 2 packs of cavalry (1 x kepi, 1 x hats) and a pack of Parrott rifled artillery. My plan is to do up a good sized force to try out the Polemos rules later this year. 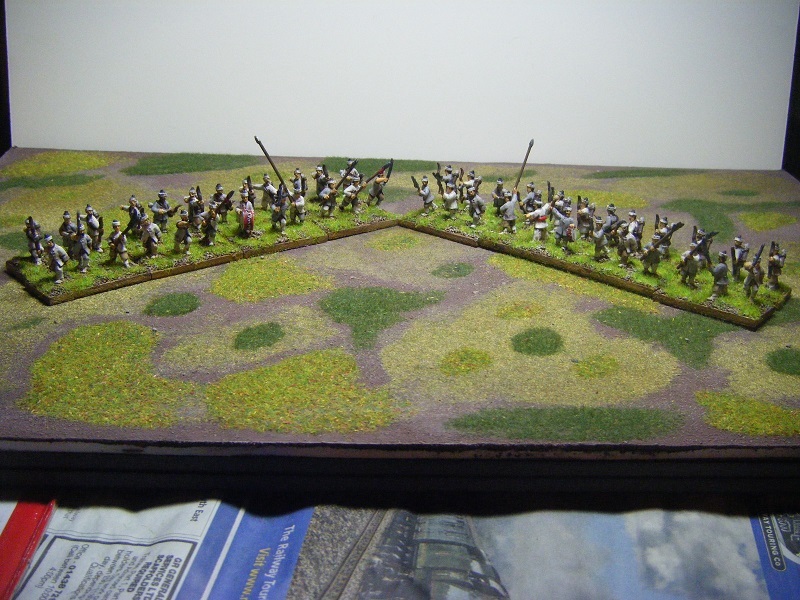 I might need to add some more artillery and cavalry later on and get some more flags. And that's it! I managed to stick within my budget. There were temptations to spend more, but I'd run out of space in my backpack and I didn't think that any more weight was sensible. 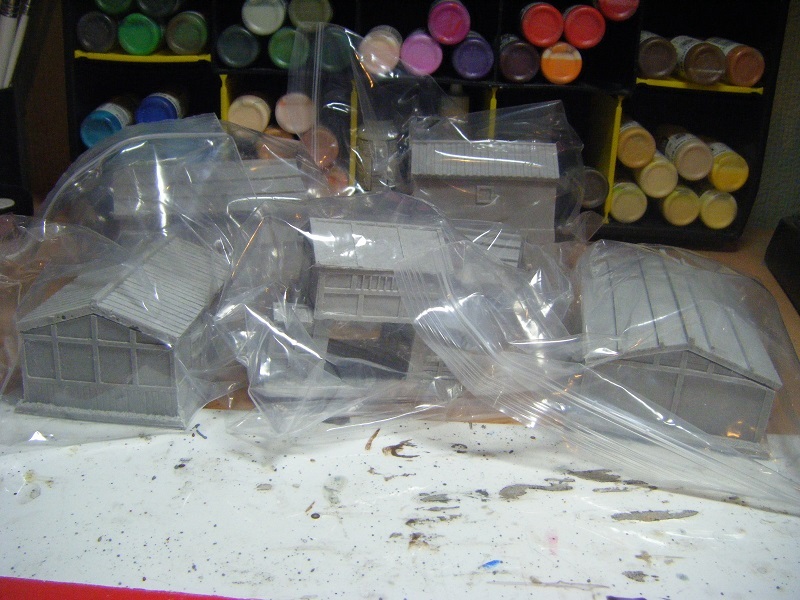 "Ahhh, but where's your sprue of the Salute 2013 Jason mini?" you ask. 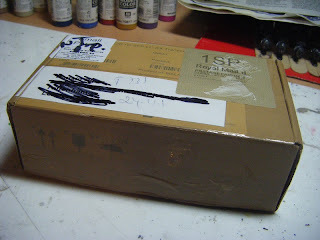 Well, Andres over at Einar Olafson Painting had an impromptu draw on his blog last night. 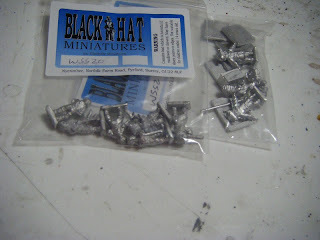 Three lucky folks who commented before 11pm would get their mini assembled and painted by him. As it turned out, I was one of only 3 people who commented so I was a winner! Andres was painting minis at the Warlord Games stall all day, so I popped over and gave him my sprue. 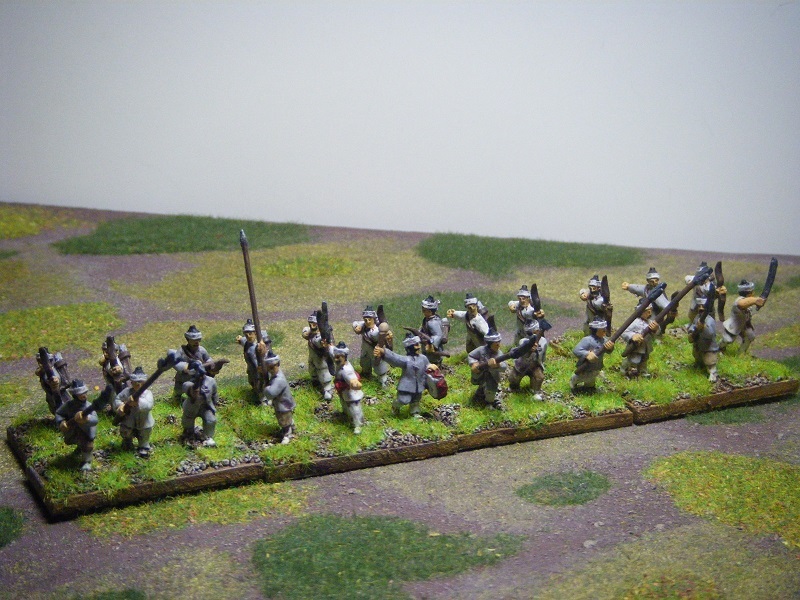 We had a chat and he showed me what he was currently working on - some casualty figures (ECW Scots? Well, definitely Scots, and I presume ECW). They looked fab. 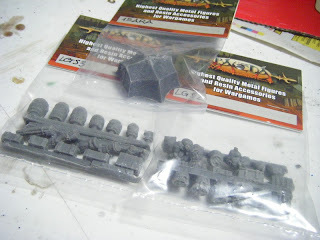 Back From Salute - A Secret Project Revealed! Well, what a fabulous day it has been. 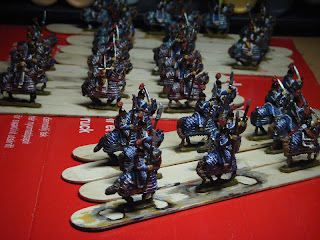 Warm, sunny and Salute 2013.
ation, I'll start with the revelation of one of the Secret Projects. To begin with, this Secret Project is approved, endorsed and blah-di-blahed by our esteemed Brush Daimyo, Curt. "My word, they are full size sandbags!" 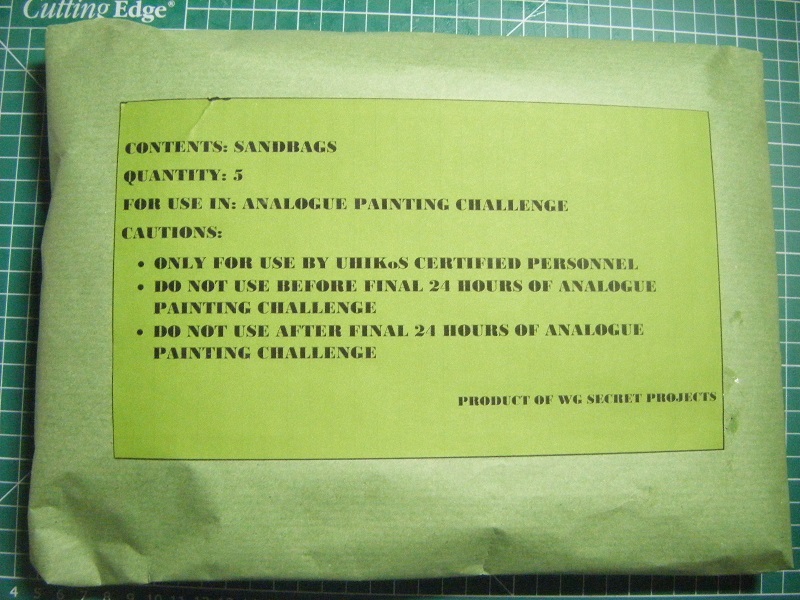 Yes, a pack of 5 hessian sandbags - I was pretty sure he must have run out and would need some more for next year's Challenge! Oh well, as the title says, I should have known better. When I came up with the idea for my Secret Projects I worked out how much time they should take and thought I had plenty of time to do them before Salute. What I forgot to take into account was work. Yup, that mean and nasty 4-letter word. At the moment I've got a rather big project on which for all of this week and next has got me running around between buildings at different ends of the campus to check on progress, identify any problems or issues then back to my office to try and get them sorted. It will be similar (but less frenetic) for a week or two after that. So, how does that affect my Secret Projects? Well, it's left me physically and mentally knackered just about every evening this week. I did make a good start on one project on Monday, with a bit more work on Wednesday, but there simply wasn't going to be time to get it finished for tomorrow especially with me falling asleep on the sofa for a couple of hours this evening. 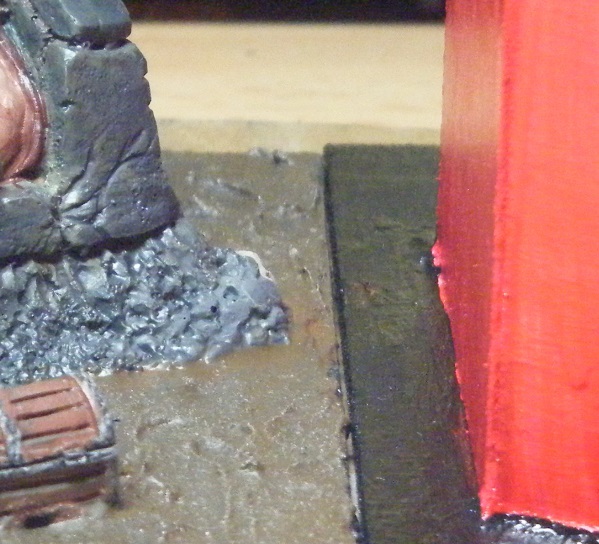 However, the other original project is much simpler and I will be able to finish that this evening. The other project will have to wait until Broadside for the big reveal (which gives me plenty of time to add some extra touches to it). 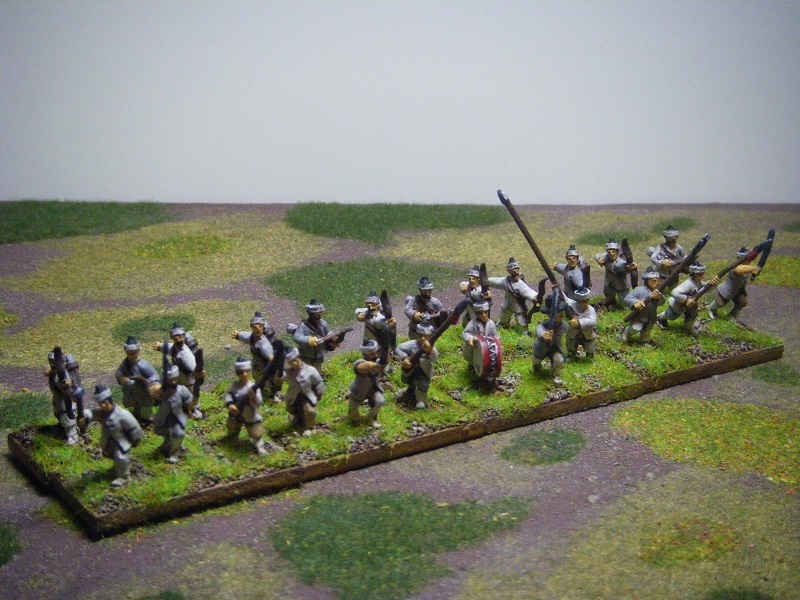 It also means that I'm behind schedule on getting my Koreans painted. 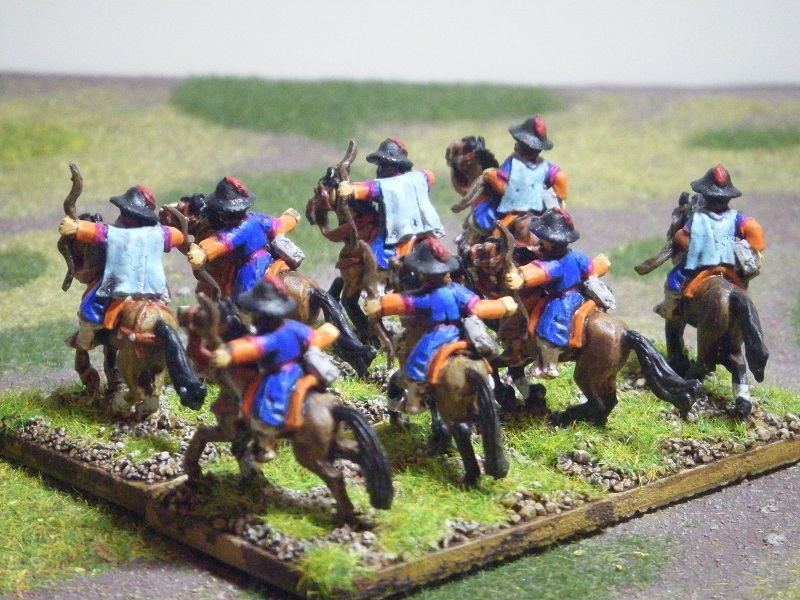 Hopefully I'll be able to get the levy troops finished over the weekend, then it will be onto the cavalry. 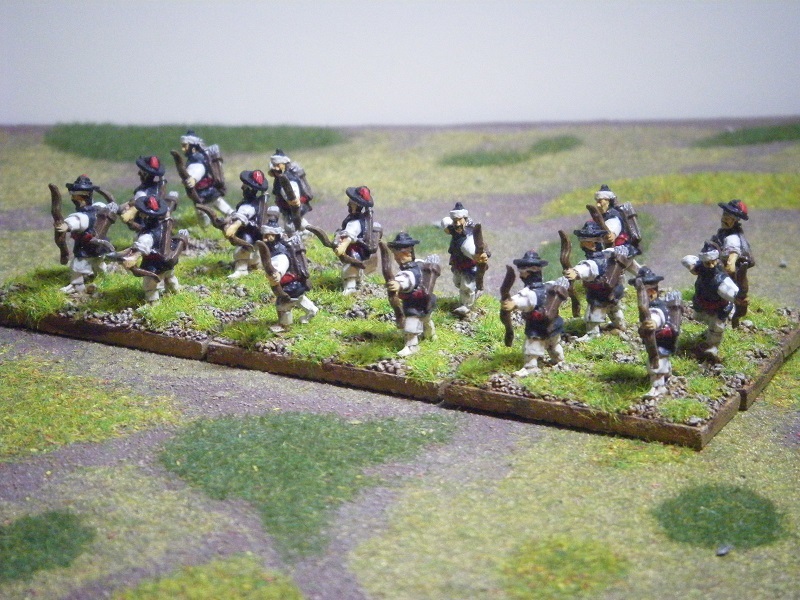 I'll also need to get my regular infantry and command groups prepped and ready to go once the cavalry are done. 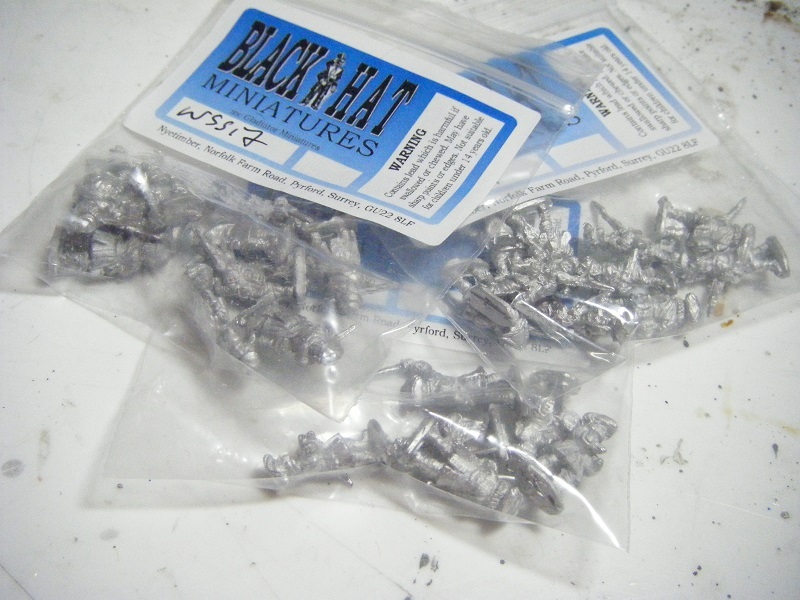 I might end up not finishing the basing on the cavalry, regular infantry and commanders before Campaign and just leave them on plain bases. Haha! I've spent a couple of hours on one of the Secret Projects this evening and made pretty good progress. A couple more sessions should see it completed. I haven't done any more painting on these since last night. 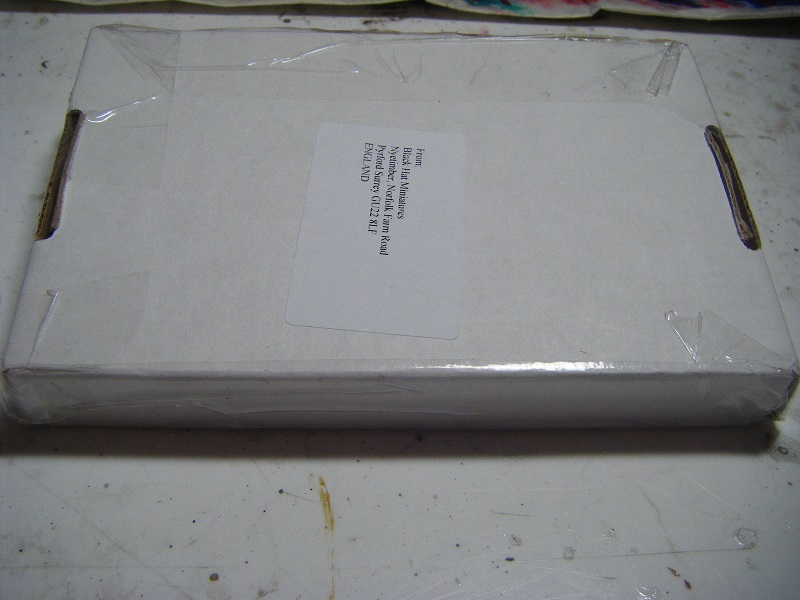 When I got home from work, there was a small packet waiting for me. 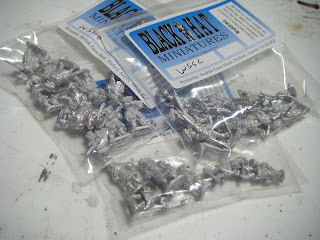 It contained the Mordheim figures I won in Carl's blog-birthday draw. The figures are gorgeous and when I finally get time to paint them, they should be really nice to do. I know, I know - I haven't posted anything since Thursday. I guess it's Sunday Update time then. 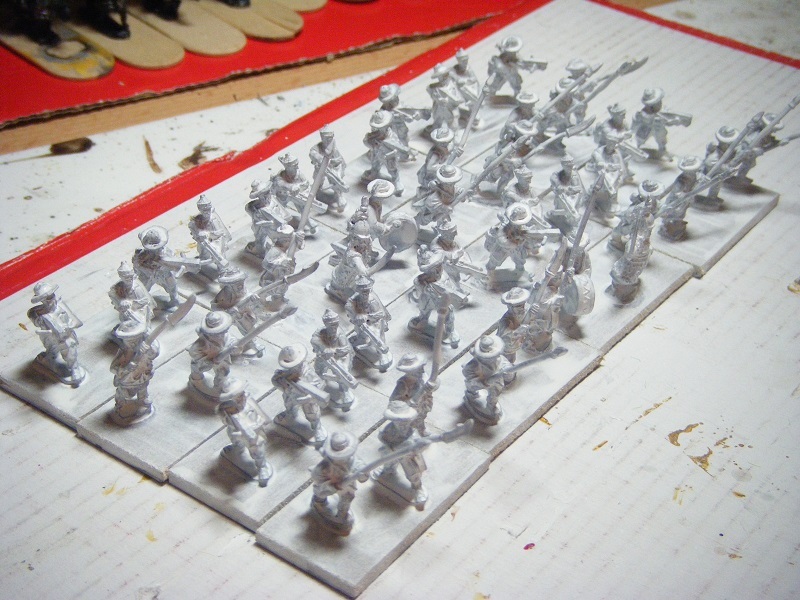 I've made a good start on the next lot of Koreans today - 16 bases (48 figures) of Levy troops. I should be able to get them finished in a couple of evenings. I've also made a start on the camp, but I won't be posting any pics of that until I come back from Campaign (yes, yet another secret project). I've started one of the Secret Projects today - the other one won't take a great deal of work. 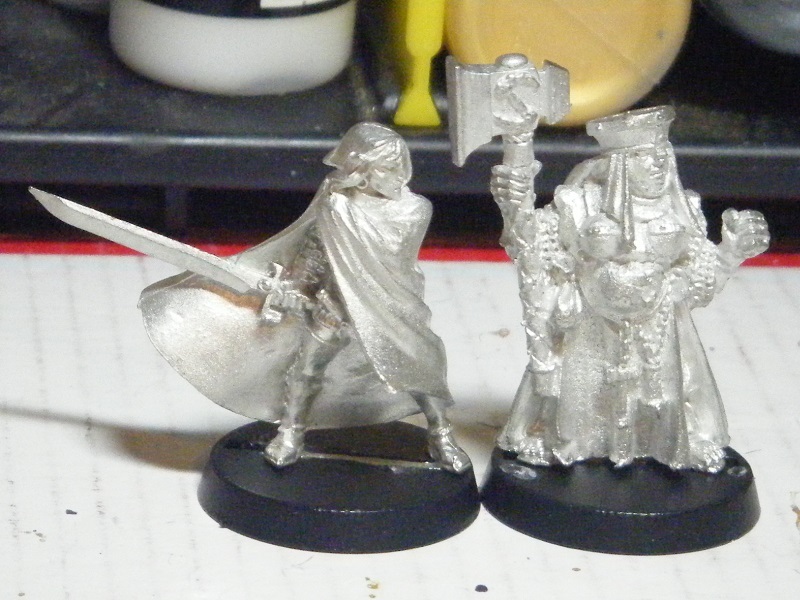 I'm really hoping that I will be able to get them both done in time for Salute. Yesterday morning saw me get up very early to catch an early train to Bletchley. 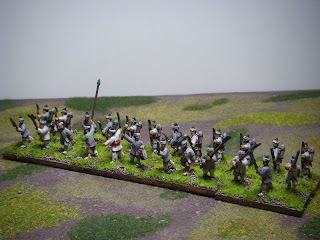 I was one of 4 members from Central London putting on FoG:AM V2 games for Battle Day. For those that don't know, Chalons was where a confederation of Romans, Alans and Visigoths under Aetius took on and defeated Atilla after he had turned his attentions to the Western Roman Empire (having bled the Eastern Empire within raiding distance dry) and gone on a rampage across France with an army of Huns, Gepids and Ostrogoths. We managed to get 2 games in, switching sides for the 2nd game. I was partnered with Gordon and we both had utterly atrocious dice luck in both games. I took loads of pics of the first game, not so many of the second. I'll get them sorted and posted here soon.